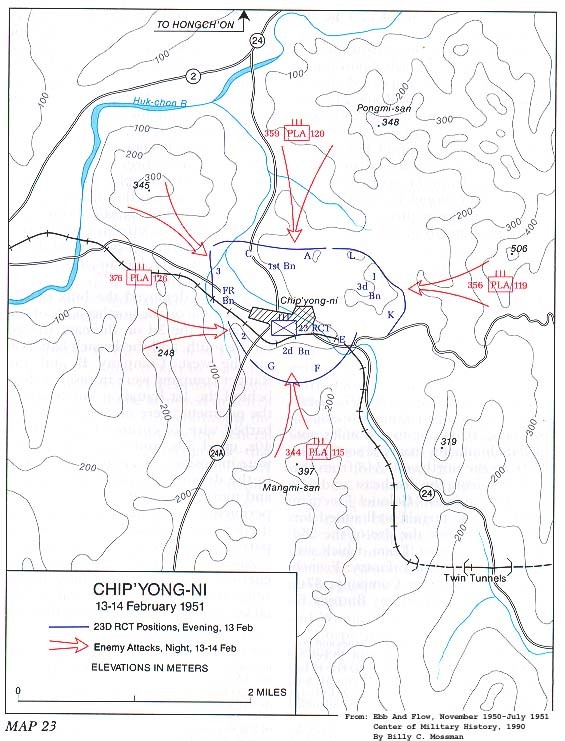 Chinese would attack after dark and the possibility that they would penetrate his position, he meanwhile marked out a second ring of defenses inside his perimeter to be manned at nightfall by Company B of the 2d Engineers and by battalion and regimental headquarters troops. Since his main supply route appeared about to be cut, he requested that a resupply of food, ammunition, and signal and medical items be airdropped on the 14th. 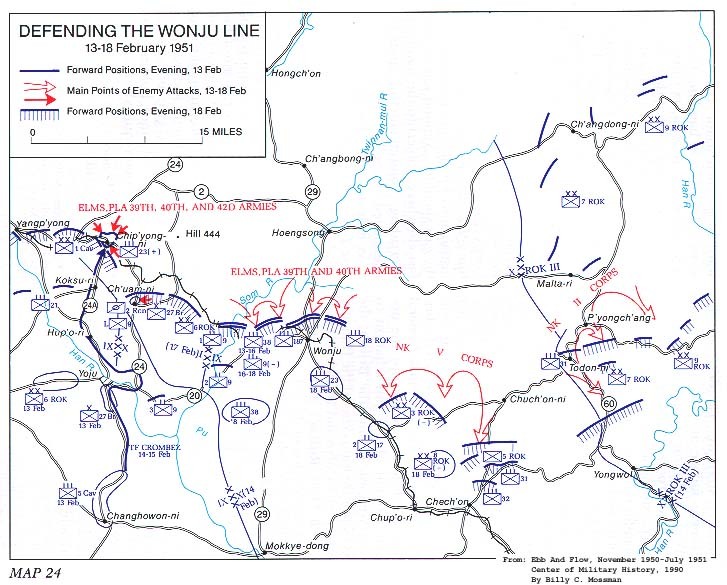 different divisions, the 115th, 119th, 120th, and 126th, and, in turn, three different armies, the 39th, 40th, and 42d, the renewal predicted by the prisoners might be considerably stronger than the first attack. ing no armored personnel carriers, he instructed the hundred sixty members of Company L, 5th Cavalry, to ride the tanks. As agreed between the Company L commander and the commander of the tanks, the infantrymen were to dismount and deploy to protect the tanks during any halt and were to remount on signal from the tankers when the column was ready to proceed. Four members of the engineer company with Crombez also were to ride a tank near the head of the column to lift any mines on the road. threw down satchel charges. A rocket that struck the turret of the lead tank wounded the gunner and loader, and the road wheels of the second tank were damaged, but both got through. The third tank was not touched, but the fourth, carrying Capt. Johnnie M. Hiers, commanding Company D of the 6th Tank Battalion, took a turret hit from a rocket, apparently a 3.5-inch round, that penetrated and exploded ammunition in the racks. The men in the fighting compartment, including Captain Hiers, were killed, and the tank caught fire. The driver, though severely burned, raced the tank through the cut and off the road so as not to block the remainder of the column. beyond the cut. The wrecker meanwhile towed in the truck and tank that had been damaged at the cut.